The Tulsa Police Department (TPD) Foundation held a kickoff fundraiser last week with shocking results. Established last year, the foundation is raising awareness of and support for the Tulsa Police Department to benefit both officers and citizens – enhancing community safety and security. The Foundation plans several programs for the Police Department based on identified needs. The first project is funding the donation of 400 Conducted Electrical Weapons known as Tasers and the first donation of 100 Tasers is anticipated within the next 45 days. TPD Foundation Chairman Roger Chasteen, volunteered to be Tasered. After dinner and a presentation by author and former Chief of CIA Counterintelligence James M. Olson, Chasteen was joined on stage by several officers. 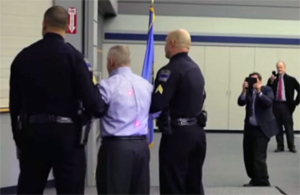 Demonstrating the Taser X2’s capabilities, Chasteen was Tasered in front of an audience of business leaders and guests. Chasteen then walked back to the podium (after a short recovery) and continued his speech on the Taser’s safety advantages. 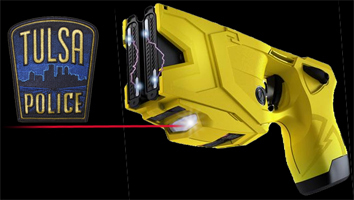 For more information on the Taser program and other efforts underway, Click here to reach the TPD Foundation site. This entry was posted in Local on January 21, 2015 by admin.